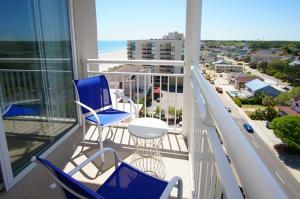 Oceanfront views are plentiful in this North Myrtle Beach vacation rental. Southshore Villas 1007 is a beautiful condo rental in the Crescent Beach section of North Myrtle Beach, South Carolina. Spacious and full of terrific amenities, this condo rental can be the backdrop for your exquisite North Myrtle Beach vacation! Southshore Villas 1007 is a four-bedroom North Myrtle Beach vacation condominium with three baths. This condo rental in North Myrtle Beach, South Carolina is an end unit so you have more windows than other condo rentals in this North Myrtle Beach resort. Let the light shine inside your North Myrtle Beach vacation rental. Rise with the sun and slip out to the oceanfront balcony for fresh air at all hours of the day and night. Ten people are beautifully accommodated in this North Myrtle Beach vacation rental. The kitchen of this North Myrtle Beach condo rental has granite countertops. Embrace all the luxuries found in this condominium rental in North Myrtle Beach, South Carolina, from the Jacuzzi tub and high-speed Internet access to a television and DVD player in every bedroom. The Southshore Villas resort is brimming with water recreation! The oceanfront pool deck at this North Myrtle Beach resort features a swimming pool, lazy river, hot tub and kiddie pool! Your family will want to play all day on this oceanfront playground. Plus, Southshore Villas 1007 is closely located to Myrtle Beach golf courses, restaurants with oysters, shrimp and crab legs on the menu and live entertainment theatres with foot-stomping productions! Being just minutes from North Myrtle Beach amusements and Myrtle Beach attractions will be icing on the cake when you reserve Southshore Villas 1007 for your next beach vacation.